By the end of the day, Israeli forces had killed 58 Palestinians and wounded over 2,700, Gaza’s bloodiest day since the 2014 war—a day that the world and certainly the Palestinians are unlikely to forget. “Deeply moved to be here,” Jonathan Greenblatt, CEO of the Anti-Defamation League (ADL), tweeted along with a selfie from inside ceremony. “All should celebrate that it’s the capital of a Jewish state that respects Christians, Muslims, Mormons, LGTQ + other minorities.” Outside the new Jerusalem embassy, Israeli police throttled a hijabi woman protester and assaulted several Arab members of Knesset. “Today, the Trump Administration declared its commitment to promoting a peaceful solution to the Israel-Palestinian conflict by celebrating the new US Embassy in Jerusalem,” Rabbi Rick Jacobs, President of the Union for Reform Judaism, stated. Jacobs expressed concern for “the growing number of Gazan dead and wounded,” but could not resist condemning “the Hamas leadership for encouraging incitement at the border with Israel”—as if Hamas’s involvement in the Great Return March protests, which began largely as an independent popular resistance initiative, somehow justified the Israeli army’s use of live ammunition against unarmed civilians. “Bittersweet,” was the strongest condemnation of the mass killings in Gaza that the Brookings Institution’s Martin Indyk could muster. Indyk is a former US Special Envoy for Israeli-Palestinian negotiations. Greenblatt’s ADL is nominally a civil rights organization. Indyk is supposedly a capable peace negotiator. Jacobs is the leader of the largest and most liberal Jewish denomination in the US. And yet on Monday, they joined the ghoulish celebration of the US embassy move, clapping along, in person and online, with a rogue’s gallery of American xenophobes, fanatical Christian Zionists, and the most right-wing government in Israel’s history. It is by now a truism that liberal Zionists, given the choice between liberalism and Zionism, choose Zionism no matter how illiberal a form it takes. The statements of Greenblatt, Indyk, and Jacobs—all, in some sense, mainstream liberal Zionist leaders—are simply a reflection of this. But taken together, their statements also indicate the new contours of the politics of Israel/Palestine in the Trump era. The embassy opening ceremony made it clear what supporting Israel looks like in practice: swilling cocktails with Benjamin Netanyahu, Sheldon and Miriam Adelson, Jared Kushner, Ivanka Trump, Steve Mnuchin, and the antisemitic Evangelical pastor John Hagee, while Israeli soldiers fire live ammunition at thousands of Palestinians literally trapped in the Gaza Strip. Like many of Trump’s policy decisions, moving the embassy did not mark a change in the status quo as much as its unmasking: the end of the illusion that the US is an honest broker between Israel and the Palestinians; the end of the farce that liberal Zionism is, in practice, anything other than an excuse for controlling and killing Palestinians; the end of American Jewish leaders’ lip-service about human rights. It is particularly telling that in Rabbi Jacobs’s statement, the only reference to rights is the sentence about Israel’s “right, and even obligation, to defend herself.” Palestinians, it seems, do not have any rights worth mentioning. Regardless of which city houses the US embassy in Israel, the US will continue to supply Israel with $3.8 billion annually to procure military technology, like drones that fire tear gas canisters at Palestinian protesters from the air. The US will continue to collaborate with Israeli intelligence services and defend Israel through its veto power in the UN Security Council. WHAT DOES THIS MEAN for the American Jewish left? The level of young Jews’ moral outrage towards the State of Israel and its defenders among the Jewish community’s self-appointed leadership suggests a turning a point. Protests in the US against the American Jewish community’s support for the occupation appear be having their intended effect. 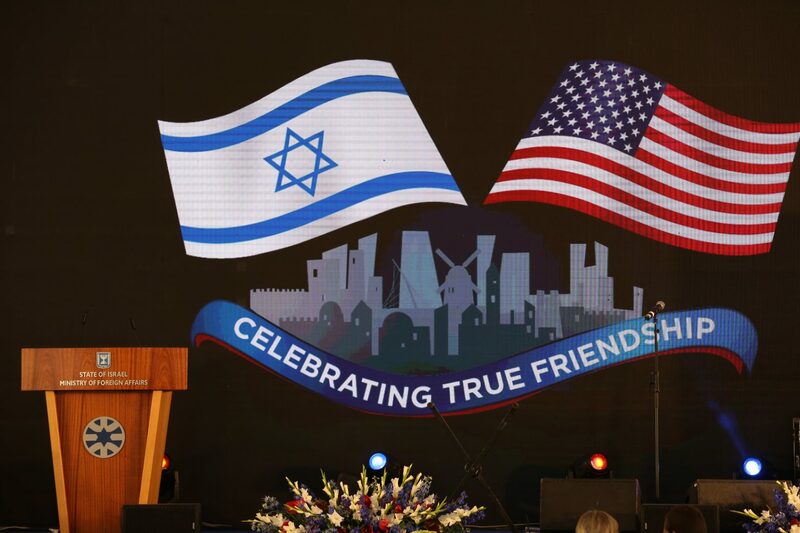 American Jews will likely remember the grotesque, split-screen spectacle of the glitzy embassy ceremony side by side footage of the mass shooting in Gaza for years to come. There is, however, a risk of the rhetoric of moral responsibility for Israel’s crimes obscuring the geopolitics that make them possible. There is also a kind of trap for diaspora Jewish activists, whose insistence on their own moral imperative to oppose the Jewish state’s policy ends up confirming Israel as singularly representative of all Jews. Incorporating anti-occupation and Palestine solidarity organizing into a broader politics of anti-militarism and anti-imperialism could help avoid these pitfalls. After all, America’s support for murderous governments and its own murderous policies abroad do not begin and end with Israel. And while the organized American Jewish community certainly facilitated the “special relationship” between Israel and the US, American support for Israel has more to do with the US’s imperial interest in maintaining a foothold in the Middle East than a deeply-felt concern for the future of the Jewish people. In The End of Jewish Modernity, historian Enzo Traverso writes that if Russian revolutionary Leon Trotsky was the archetype of Jewish politics in the first half of the 20th century, then Henry Kissinger, Richard Nixon’s Secretary of State, was the archetype of Jewish politics in the century’s second half. Traverso writes, “Trotsky and Kissinger embody, beyond the chronological distance that divides them, two paradigms of Jewishness”—the Jew as revolutionary, and the Jew as imperialist. The moving of the US Embassy—with Jared Kushner, Ambassador David Friedman, and Treasury Secretary Steven Mnuchin filling in for Kissinger—made the choice between those two paradigms of Jewishness starker than ever. And by attempting to stand in the crumbling center, liberal Zionists have sided with empire. For the rest of us, the choice remains: Will we be imperialists, or will we be revolutionaries? Joshua Leifer is an associate editor at +972 Magazine. His writing has also appeared in Dissent, Jacobin, and n+1. He is currently based in Jerusalem.